House F residents pose with their prize, originally swiped from an Eastmoreland residence. Doyle owl: Strigidus cementus. Unofficial mascot of Reed College (the official mascot being the griffin (q.v.). While the griffin is a mythical beast, the Doyle Owl is concretely real, although most of the tales of the owl are myths. 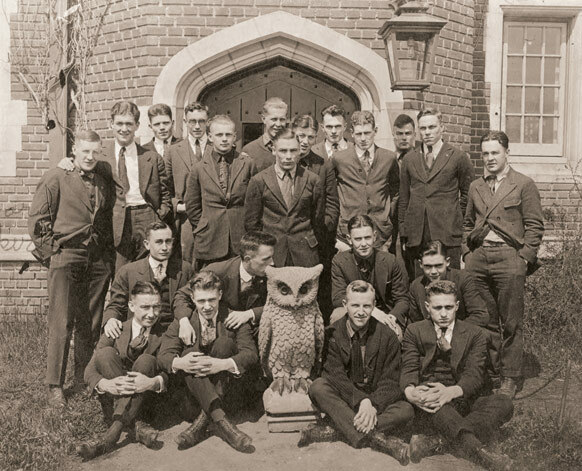 The original owl was a local piece of garden sculpture, which was carried off as a prank by students living in House F (later renamed Doyle). Since then, there have been many incarnations of the Doyle Owl; the present avatar is owl number 23, plus or minus 11. Almost all of them are made of concrete and weigh over 100 pounds (although there was at least one anti-owl, made of papier-mâché). Contrary to prevalent myth, the Owl was never one of the animals adorning the roof of Old Dorm Block; those are and always have been beavers. The owl is the paradigm of a trophy, defined by Jay Rosenberg ’63 as “a heavy object of absolutely no intrinsic value whose only purpose is to be possessed and shown by its possessors in public places, without loss of possession.” In the full exercise of the owl tradition, it is painted, shown spectacularly, successfully defended from would-be possessors, and shortly thereafter left unobtrusively but openly to be discovered by a new ownership group. Most showings have been on campus, although the owl has been documented in settings as far afield as the New York World’s Fair (1939) and the Top of the Mark [Hopkins Hotel, San Francisco]. The solidity of the concrete has been evidenced by a showing at the bottom of a swimming pool, presumably in the San Fernando Valley or possibly Beverly Hills. The owl has been known to spend the occasional quiet weekend at the ski cabin. It has appeared at a campus seder when the door was opened to admit the prophet Elijah. It has substituted for Boris during the Boar’s Head procession of the annual alumni holiday party. It was once displayed in commons, and escaped only after someone cut the electricity and plunged the room into darkness. Capturing the owl has become increasingly daunting in recent years. Those releasing it back into the wild constantly seek to trump the efforts of their predecessors. This has led to the owl’s being airlifted off campus by helicopter, rising like a specter from the steam tunnels, dangling from a tree whilst being set aflame, and trundling forth from Sallyport encased in a massive block of ice. (This particular incident required the combined efforts of 20 students, a flaming papier mâché decoy, and the strategic use of the walk-in commons freezer.) The resulting owl fight lasted a good seven hours as teams struggled back and forth with the chilly prize, some attempting to defrost it, others simply bent on wrestling the beast into a getaway vehicle as quickly as possible. The most notable side effect of exposure to the owl is, of course, owl fever—a disease so virulent that it can turn even the most demure Reedies into a howling mob who will stop at nothing to secure their feathered prize. Alumni, faculty, students, staff—all are caught in the inescapable sway of the owl. The question of why a nondescript garden statue from Eastmoreland still inspires such passion remains unanswered. 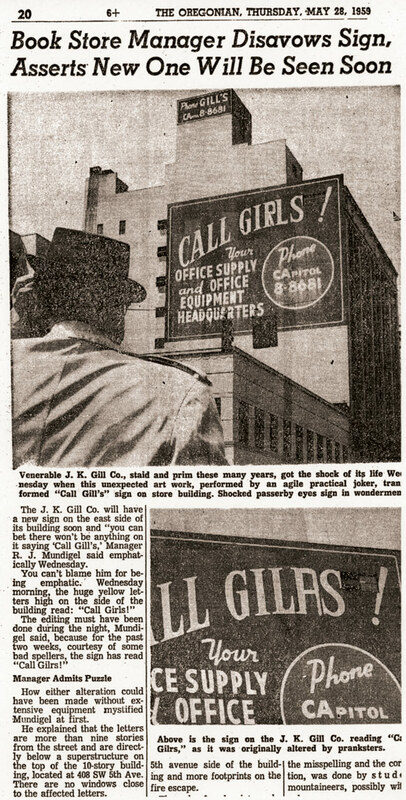 The J.K. Gill’s sign after pranksters corrected their error. Economics: The study of a mythical creature known as the Rational Actor—no wonder it is so dismal. Economics became a stand-alone department in 1922. Intriguing courses have included Game Theory; History of Economic Thought; Innovation and Technological Change; and The Economics of Reed College. Influential profs (q.v.) have included Hudson Hastings [1911-20], William Ogburn [1912–17], Clement Akerman [1920–43], Adelbert Friedrich [1921–29], Blair Stewart [1925–49], Arthur Leigh [1945–88], Carl Stevens ’42 [1954–90], George Hay [1956–83], Jeff Parker [1988–], Noelwah Netusil [1990–], Denise Hare [1992–], and Kim Clausing [1996–]. 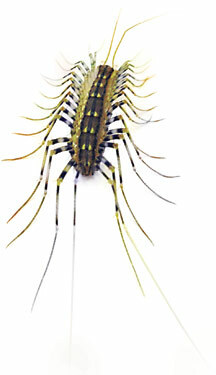 Eliot bug: Scutigera eliotopedia. Arthropod denizen of Eliot Hall, possible relative of the centipede. Legend states that the Eliot bug was the result of a freak accident in the chemistry lab on the fourth floor in the early years of the college. It boasts monstrous antennae, at least 15 pairs of legs, and astonishing bursts of speed as it dashes into dark corners to avoid being called upon in conference. Eliot, Thomas Lamb (1841–1936): Unitarian minister and outspoken social progressive who urged Simeon and Amanda Reed to found a college. Hailing from a storied family with roots in Boston and St. Louis, Eliot arrived in Portland in 1867 and soon became one of the pioneer city’s leading figures. He founded the First Unitarian Church, the Oregon Humane Society, and the Boys’ and Girls’ Aid Society. He worked to improve conditions in the county jail; ministered to orphans, the poor, and the mentally ill; and championed public schools, the public library, and women’s right to vote. He enjoyed the confidence of many of the city’s leading citizens, including Simeon and Amanda Reed, who sang in his choir. Eliot sowed the first seed for his greatest ambition in 1887 when he wrote Simeon Reed a letter, proposing a “Reed Institute of Lectures,” and joked that it would “need a mine to run it.” Not only was Eliot instrumental in persuading Simeon and Amanda to found a college, but he was also responsible for shaping its character, arguing that the institution should teach the liberal arts and sciences as opposed to technical vocations. At the college’s first commencement, in June 1915, he was honored with the degree of Doctor of Letters. He continued to be intimately involved in Reed’s operations until 1924, when age and ill health compelled him to resign from the board. Eliot was an insomniac who rose at 3 a.m. He was also plagued by eye trouble, possibly the result of a teenage episode of measles. Nonetheless, he was a voracious reader, committing to memory the psalms, the sonnets of Shakespeare, and long passages from Milton, Wordsworth, the Iliad, the Odyssey, and Don Quixote. He oversaw the purchase of books for the public library, and read all the major articles in the ninth edition of the Encyclopaedia Britannica, volume by volume, as they were published. Eliot, T. S.: Obscure vaguely poetical nephew of T.L. Eliot (q.v.). English: The gentle art of producing an analysis six times longer than the original text. Early courses at Reed included Public Speaking and Argumentation, The English Bible, Chaucer, Shakespeare, and The Novel. Other intriguing courses have included Narratives of Slavery and Freedom; The Emblematic Eye; Caribbean Re-writings; New York, New York; Frontier Literature; The Death of Satan; Graphic Novel; Film Noir; and The Victorian Marriage Plot. Influential profs (q.v.) have included Norm Coleman [1912–39], V.L.O. Chittick [1921–48], Barry Cerf [1921–48], Ruth Collier [1933–52], William Alderson [1943–64], Donald MacRae [1944–73], Frank Jones [1949–56], Kenneth Hanson [1954–86], William Halewood [1959–67], Charles Svitavsky [1961–98], Roger Porter [1961–], Fred Hard [1962–70], Tom Gillcrist [1962–2001], Jon Roush [1964–70], Howard Waskow [1964–72], Jim Webb [1965–71], Simon Friedman [1971–77], Peter Sears [1974–80], Robert Knapp [1974–], Lisa Steinman [1976–], Christina Zwarg [1979–85], Gary Miranda [1979–87], Gail Berkeley Sherman [1981–90], Ellen Stauder [1983–], Chris Zinn [1985–92], Nathalia King [1987–], Laura Leibman [1995–], Pancho Savery [1995–], Jay Dickson [1996–], Michael Faletra [2001–], and Maureen Harkin [2002–]. Financial aid: Assistance provided to needy students to offset heartstopping cost of tuition (q.v.). Comes in bewildering variety of grants, loans, and work study, funded by the government and by the college itself. About 52 percent of students currently receive financial aid; average package is $34,200 per year. Reed meets the full need of all continuing students who maintain satisfactory academic progress (six units annually and a GPA of 2.0) even if their family income suddenly collapses. Reed also tries to meet the full need of freshlings and transfers. Each year, however, a small number of applicants are not admitted because the college’s financial aid budget (now about $22.5 million) has been exhausted. If you are outraged by this, please see philanthropy. Foster, William T. [prez 1910–19]: The “masterbuilder.” A brilliant prodigy from Bowdoin, Foster was just 31 when he was appointed Reed’s first president. Scornful of the “sheep-dip method of education” that permeated college life in that era, he set out to create a new kind of college where the Socratic ideals of critical examination and intellectual freedom were dominant from day one. He banned grades, intercollegiate sports, fraternities and sororities, and imposed high standards in the senior thesis and oral exam, and for faculty advisers. Professors would focus on teaching, not research. Students would discipline themselves and choose their own course of study. 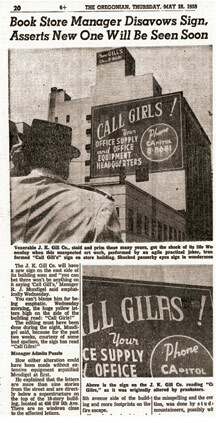 With an evangelist’s zeal, Foster recruited professors and students to join him in this visionary project. Unfortunately, his revolutionary fervor rubbed many Portlanders the wrong way, as did his enthusiasm for simplified spelling (q.v.). 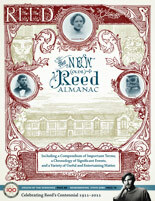 The collapse of property values in the 1910s wrought havoc on Reed’s endowment and spelled an end to many of his ambitious plans. His outspoken opposition to American involvement in World War I made matters worse. Many people confused him with communist leader William Z. Foster (just as they confused shipping tycoon Simeon Reed with communist journalist John Reed). Money grew so tight that Foster was forced to drop his beloved humanities disciplines in place of vocational courses. Facing financial crisis, failing personal health, student discontent, and a lack of confidence among the trustees, he resigned in 1919 and moved to Newton, Massachusetts, where he directed a foundation for economic research and published a series of influential books on economics. When he died, his ashes were scattered over the canyon. Free love: The third part of the trinity that makes up the official unofficial motto of the student body. Adopted as defiant satire sometime in the 1920s, the slogan has been repurposed ever since with varying degrees of irony—irony typically lost on outsiders who only see the T-shirts and shudder. Certainly catchier than the phrase suggested by T.L. Eliot (q.v.) from Matthew 5:15, Ut luceat omnibus (“That it may shine on all”). Try putting that on a T-shirt. French: The language, culture, and theory of the greatest civilization ever known. Courses over the years have naturally reflected contemporary issues: in 1916, for example, the college offered Soldier’s French. In recent decades, Bill Ray’s classic Introduction to Literary Theory has held enduring appeal. Other intriguing courses have included Masterpieces of the Last Three Centuries, French Drama, French Lyric Poetry, Belgian Literature, Surrealism, and Francophone Literature. Influential profs (q.v.) have included Benjamin Woodbridge [1922–52], Cecilia Tenney [1921–63], Roger Oake [1950-74], Sam Danon [1962–2000], Paul Antal [1968–75], Bill Ray [1972–], Jane McLelland [1974–81], Doris Berkvam [1975–2001]. Gerard Gasarian [1982–89], Hugh Hochman [1999–], Ann Delehanty [2000–], Luc Monnin [2004–], and Catherine Witt [2005–]. German: The language and culture of the greatest civilization ever known. In Reed’s early days, German was for some reason taught alongside Greek under the department of Germanic languages. Intriguing course titles have included Scientific German, Sturm und Drang, Rationalism and Irrationalism, Exile, The Holocaust and the Limits of Representation, and Mythos and the Daemonic. Influential profs (q.v.) have included Charles King [1926–41], Heinz Peters [1940–59], Kaspar Locher [1950–88], Alan Logan [1953–60], Werner Schlotthaus [1960–67], Vincenz Panny [1963–84], Dieter Paetzold [1963–86], Ottomar Rudolf [1963–98], Ülker Gökberk [1986–], Marion Doebeling [1990–97], Katja Garloff [1997–], and Jan Mieszkowski [1997–]. Grade inflation: Vile phenomenon in which mediocrity marches to the front of the alphabet. Virtually unknown at Reed. The average GPA for Reed students is 3.08 and has scarcely budged in 26 years. In that time, only 10 students have graduated with a perfect 4.00 GPA. Graduation rate: Reed’s graduation rate was never exactly stellar for a host of reasons, including sunshine deprivation, the grueling workload, and Reedies’ propensity to drop out and pursue their dreams. (Can you say Apple?) In the early ’80s, only 28 percent of students graduated in four years. Since then, the figures have shown dramatic improvement, thanks to a sustained effort to improve student life and boost academic support. Today the four-year rate is 70 percent and the six-year rate 79 percent. Great Lawn: A vast expanse of green, ideal for dogs, Frisbee, softball, commencement, hot air balloons, physics experiments, and reading Plato. In A.E. Doyle’s original master plan, the lawn was envisioned as a giant grassy quadrangle criss-crossed by walkways and flanked with Gothic buildings.